Acheson, Dean. Present at the Creation. Acheson, Dean. The Korean War. Appleman, Roy. South to Naktong, North to Yalu. Appleman, Roy. East of Chosin. Appleman, Roy. Escaping the Trap. Appleman, Roy. Disaster in Korea. Appleman, Roy. Ridgway Duels for Korea. Ballenger, Lee. 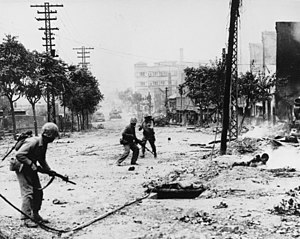 The Final Crucible: U.S. Marines in Korea 1953. Ballenger, Lee. The Outpost War: U.S. Marines in Korea 1952. Bateman, Robert. No Gun Ri. Blair, Clay. The Forgotten War. Boyd, Arthur. Operation Broken Reed. Bussey, Charles. Firefight at Yechon. Chen, Jian. China’s Road to the Korean War. Coleman, J.D. Wonju: The Gettysburg of the Korean War. Cummings, Bruce. Korea’s Place in the Sun. Davis, Burke. Marine! The Life of Chesty Puller. Dean, William. General Dean’s Story. Gilbert, Oscar. Marine Corp Tank Battles in Korea. Goncharov, Sergei et al. Uncertain Partners. Goulden, James. Korea: The Untold Story of the War. Gugeler, Russell. Combat Action in Korea. Halberstam, David. The Coldest Winter. Hamburger, Kenneth. Leadership in the Crucible. Hanley, Charles. The Bridge at No Gun Ri. Hastings, Max. The Korean War. Hoyt, Edwin. The Bloody Road to Panmunjon. Issacs, Harold. No Peace for Asia. Knox, Donald. The Korean War: Pusan to Chosin. Knox, Donald. The Korean War: Uncertain Victory. Leckie, Robert. Conflict: The History of the Korean War 1950-1953. Marshall, S.L.A. Pork Chop Hill. Marshall, S.L.A. The River and the Gauntlet. McWilliams, Bill. On Hallowed Grounds. Millett Allan. The War for Korea 1945-50: A Burning House. Millett, Allan. Their War for Korea. Nolan, John. The Run-up to the Punch Bowl. Owen, Joseph. Colder Than Hell. Paik Sun Yup. From Pusan to Panmunjon. Rees, David. Korea, The Limited War. Ridgway, Matthew. The Korean War. Russ, Martin. The Last Parallel. Russ, Martin. Breakout: The Chosin River Campaign. Stone, I.F. The Hidden History of the Korean War. Thompson, Reginald. Cry Korea: A Reporter’s Notebook. Toland, John. In Mortal Combat. Truman, Harry. 1946-1952 Years of Trial and Hope: Memoirs. Varhola, Michael. Fire and Ice: The Korean War 1950-1953. Whiting, Allen. China Crosses the Yalu.